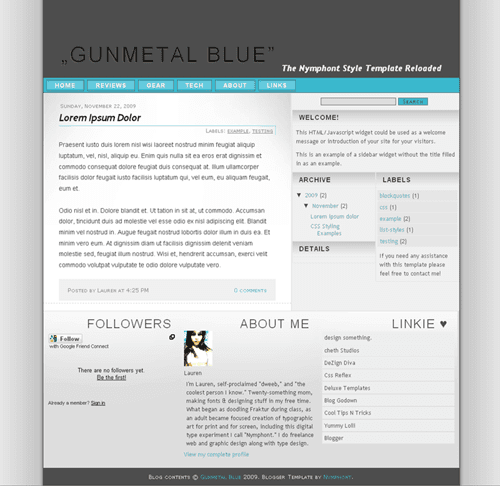 Introducing my latest free XML Blogger Template, Gunmetal Blue - The Nymphont Style Template Reloaded. Gunmetal Blue serves as the more masculine alternative it's aforementioned predecessor. Fonts and colors in both templates can be changed from the Blogger Dashboard, but I still thought that offering a contrasting color scheme such as these blues and grays might be beneficial to those who might not have been able to get past the pink. Also, I removed the social icons in the sidebar and re-styled the search box. Optional and customizable Linkbar, have as many or as few links as you prefer. Super easy to implement, details below. Images included, you do not need to upload the images to your own server, they are stored in my tinypic.com account which allows generous direct linking bandwidth. However, users who have access to an image host are advised to download the images and upload them to their own server, as the bandwidth could potentially be exceeded in the future. Download the images from here. Specific instructions on replacing the images in your template can be found in this post on the Nymphont Style demonstration blog. This is a fully functional template once uploaded to the Blogger Dashboard, meaning you do not need to change any of the code, all data from your blog should be reflected upon it's implementation. However, If you do have access to your own image host, you might want to hos the images at your own server. To do so download the images here and read the instructions here.